Baptism is a Christian sacrament or rite by which individuals are formally initiated or admitted into the Church. A Christening is a naming ceremony during which an infant receives a Christian name which almost always take place during a Baptismal ceremony. Infants, children and adults can all be Baptised and Christened. Flowers are a part of most of these celebrations, so florists who can provide advice on the flowers associated with these events, arrangements preferred for both children and adult Baptisms as well as floral party favours to accompany the festivities can really take advantage of this market. Floral arrangements for children’s Baptisms, particularly those such as table centrepieces or bouquets which will be used at private parties, often include more colour and more whimsy than those used in churches. Shapes which symbolise religion or faith such as crosses, angels, Bibles, prayer books, hands at prayer, doves, rosary beads or the initials of the child can all be constructed out of flowers. Children may also have themes for their parties, for example butterflies or bunnies. Balloons in the shape of crosses and small figurines of doves, angels, babies and parents with children may also be attached to floral arrangements for child Baptisms and Christenings. 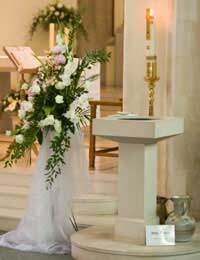 Adult Baptisms usually employ more elegant floral arrangements than those for children. Muted colour schemes of white and pastels are more common and arrangements in the shapes of crosses are about as whimsical as it will get. Centrepieces filled out with greenery or larger bouquets are more frequently used than novelty displays. Instead of balloons and figurines, candles and framed photographs are often used to create larger displays and tablescapes. Party themes are not usually a part of adult Baptism celebrations. Families which host parties for those just Baptised and Christened may choose to offer floral party favours for guests to take home. Small bouquets and single stems are easy for families to play on trays and offer to guests on their way out. Providing corsages for female relatives of the Baptised and boutonnieres for the males is sometimes a sign of respect for visiting family members. Some families may even choose to send guests home with flower seeds so that beautiful blooms may be planted in many different communities in honour of their newly Baptised relatives. Both adults and children may be Baptised and Christened, so understanding the different floral needs of each is important for florists who want to provide well for their customers. Knowing the types of flowers most often associated with these events and the kind of floral party favours that families might choose are also imperative for a floral business hoping to break into this niche market. The information given was very informative. Excellent ideas.